Emerging focuses on the skills necessary for academic writing in any discipline—and offers concrete strategies for improving those skills. Author Barclay Barrios uses an inquiry-based approach to help students understand and write about a variety of texts, while innovative assignment sequences explore the important but unsettled issues that shape our lives, such as How is technology changing us?, How can you make a difference in the world?, and a central question of our time, How can we get along? 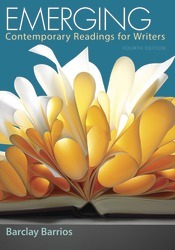 Thought-provoking, contemporary readings help students address those questions in meaningful ways. Fifteen new readings and updated writing assignments keep Emerging in tune with current ideas that will challenge students to think beyond their own experiences—and beyond the classroom.